Franklin Thomas Waters’ map of the land grants shows that William Lampson was granted a valuable block of land alongside the Great Cove on the south side of the Ipswich River, beginning at the intersection of County Street and Poplar Street, and continuing in a narrow band along Turkey Shore to Tansy Lane. “William Lampson was born in England, and came to this country in 1634. Of his arrival we know nothing, but he went to Ipswich soon after he landed, and the records show that on Feb. 5, 1637, there was “granted unto William Lampson six acres of planting ground, between Paul Williamson’s meadow and Goodman Andrews, ten acres near the upper end of Labour-in-Vayne Creek.” In 1640,he received another grant of land, and in that year it was voted that “the highway to Chebaco beneath Heartbreak Hill (Argilla Road) forever be repayred by the benefit of the grass yearly growing upon the same,” and John Leigh was to enjoy all the profits for “maintaining the highway from Rocky Hill to William Lampson’s lot.” (editor’s note: Old England Road). “Thus we see that William Lamson was early a man of property, and from the extracts from the town records we find him to have been a man of considerable standing in the community and interested in town affairs. His name appears on a list of Freemen of Ipswich, May 17, 1637. This shows that he was a member of the church in good standing and thereby entitled, after taking the oath of allegiance, to vote for the officers of the Colony and take part in town affairs. In 1641 he was entered as a Commoner on the Town Book of Ipswich, which showed that, owning a house and land within the bounds of the town, he was entitled to the right of pasturage for his cattle in the wide domain beyond the Common fence. These Commoners, from the very beginning, met in Commoners’ meeting, had their own records and legislated with reference to all the duties and privileges of Commoners and voted on all questions relating to the common lands. In 1657 it was “ordered that Wm. Lamson (and others) pay 12d y head to the cow keeper for their cowes going on the Common according to an order made in March last.” One of the earlier offices which he held was that of Pounder, and the duties were to care for stray animals, shut them up in the public pounds and collect the fines due. 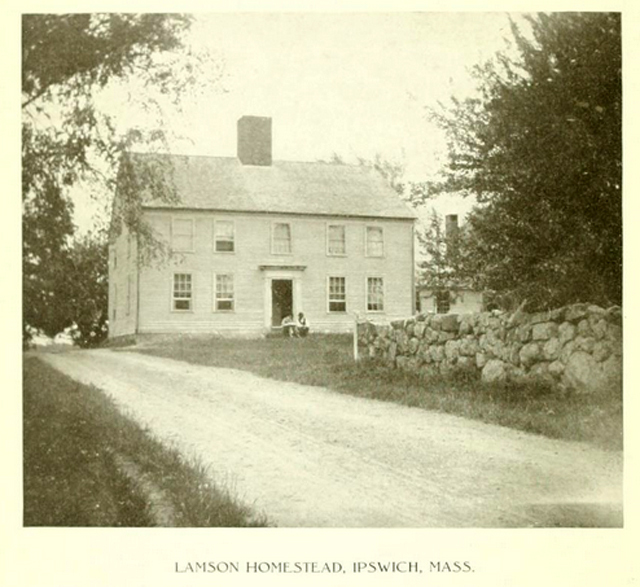 The Lamson family multiplied in the Ipswich area, and within a few years we find the family name listed on Linebrook Road near Topsfield, and in the Hamlet (now Hamilton). Bradley Webster Palmer (1866–1946) was a prominent U.S. attorney and businessman. He was involved with the creation and development of multiple corporations, including the United Fruit Company, Gillette Safety Razor Corp., and International Telephone & Telegraph Corporation. He was also part of the American delegation at the Paris Peace Conference following the First World War. 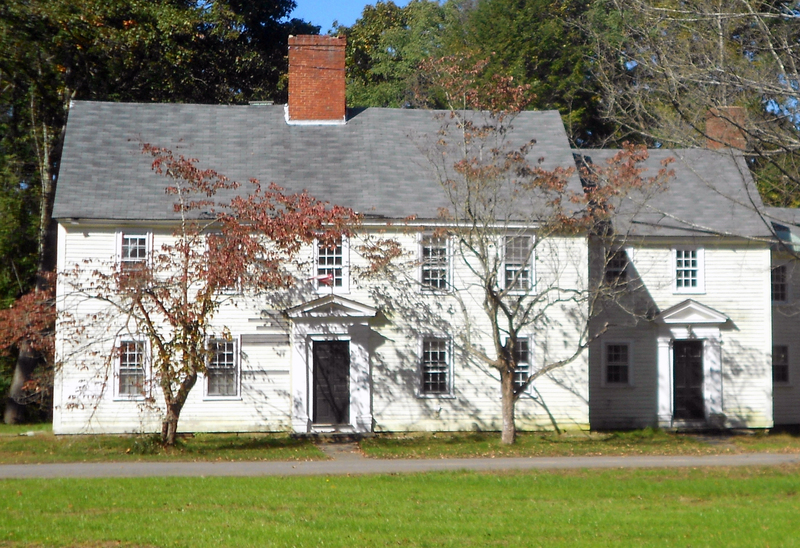 Around 1891 Palmer began to acquire over 10,000 acres near the Ipswich-Topsfield line. In 1898 Palmer purchased the hereditary farm holdings of the Lamson family, some 747 acres and built a stone mansion near the Lamson house, leaving it standing. He named the estate Willowdale. In the years 1937 to 1944, Palmer donated all of the property to the Commonwealth of Massachusetts, leasing back the 107 acres surrounding his mansion. The state established Bradley Palmer State Park and Willowdale State Forest on the properties.